This will be my new blogging home. I will be posting My Widow Rants here, but I wanted a new avenue for the other topics tugging at my heart. I struggled a bit with how that new avenue for writing was going to look, but this space is where I’ve decided to reside. 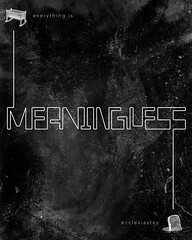 Meaningless, meaningless, it’s all meaningless. It’s pointless, it’s useless, it’s smoke. Israel your king declares it. He claims to know. The Money. The Power. The Women. The Wealth. It has been done before, and it will be again. As if he is lying you continue to chase it. Good people you aren’t listening to your king. Don’t turn to me for joy, for light, for kindness. Simply eat. Simply drink. Simple live. Then die. You do not understand. You will not understand. Rich or poor, wise or dumb, it’s all the same. The same fate for you as me; no good, no bad. This entry was posted in Faith Reflections, My Life by Stephanie Danielson. Bookmark the permalink.